Kyle had the pleasure of joining Vaughn Johnson (Philly.com) and Nick Piccone (PhillyVoice.com; BleedPhilly.com; PhillyInfluencer.com) on The Straight Shooters to discuss the latest in pro wrestling. The guys hit on these topics: Jimmy “Superfly” Snuka’s arrest and charges for murder, Zahra Schrieber’s firing from WWE, TNA’s Bram being arrested for domestic violence, and the guys also hit on Raw from this past Monday. The guys take a few callers and then end the show with a new segment: the Thursday Night Debate. Listen to the podcast after the break or here if the embedded feature doesn’t work on your device. If you're like 90 percent of our Twitter feed, you undoubtedly spent a significant portion of your Monday evening watching a police chase that started in New Jersey, crossed into Philadelphia, went back to New Jersey and finally ended in Philadelphia. The chase began at approximately 8 p.m. Monday, and the vehicle is believed to have been part of an armed robbery in New Jersey. The driver evaded police for nearly two hours, and even made a brief pit stop at the Deptford Mall before returning to Pennsylvania and working their way out of a few situations where they seemed to be caught. The chase finally ended when a police officer clipped the van and it flipped (video after the break). The most excitingly underwhelming night in the Philadelphia sports blog year has arrived. 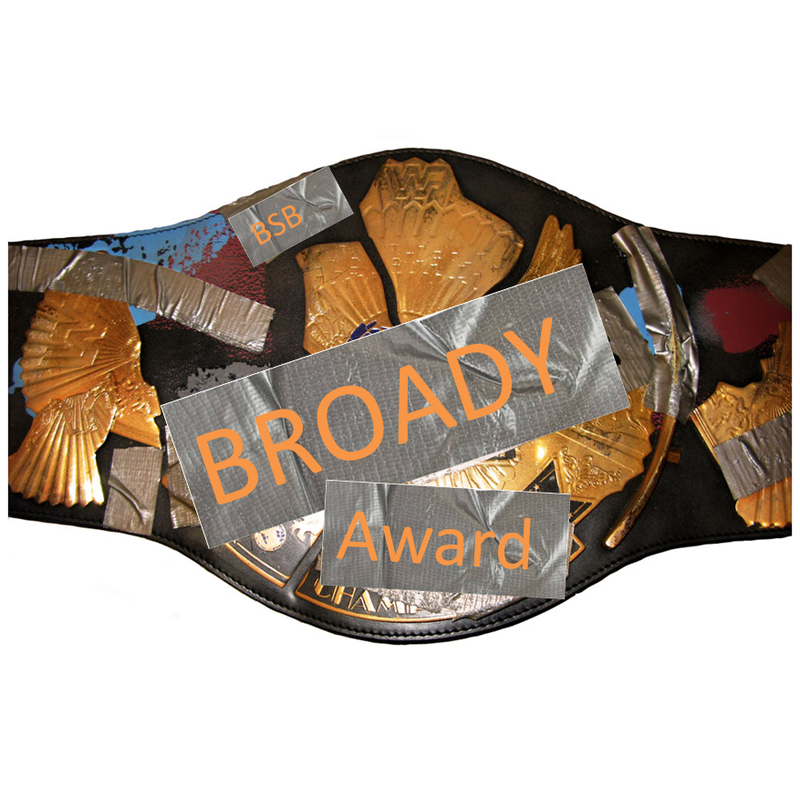 Yes folks, it's the 2014 Broady Awards! All of Philadelphia's finest, by which I mean anyone who follows us or visits the site, will be walking the whatever-color-carpet-is in-their-house tonight. So sit back and enjoy responsibly, or enjoy irresponsibly. Honestly, who are we to tell you what to do? Well week one is in the books, and the Sixers are who we thought they were. They are currently one of the only four teams without a win yet this season and hopefully they can keep it that way. Disregard wins, acquire ping pong balls. But not just any ping pong balls; no amount of basement table tennis will make the Sixers any better. No, they specifically need the NBA Lottery ping pong balls so they can get the number one pick next June. Our follower Alex Ferraro challenged the fine gentlemen of the BroadStBeat to take the ALS Ice Bucket Challenge. Kyle was the first to respond. I challenge Ducis Rodgers, Wired 96.5's Big Philly Show and our Twitter follower Dan Aleksander. You have 24 hours folks. With the combined flavor of mango and salsa, you would expect a particularly boisterous aroma. However, when we took our first whiff upon opening the bag, the aroma was barely noticeable. There was a faint tropical smell, as mango was the most prevalent smell coming from the bag. When you take your first bite of the mango salsa chip, the mango flavor rushes to your senses and hits you immediately. It's a strong first bite, but a pleasant one. However, once you dive into the bag and eat a few more chips, the mango taste weakens and is barely noticeable about five chips in. The after taste is very pleasant, as you notice the change from mango to salsa. The after taste isn't very strong or pungent and won't remind you of what you just ate three hours later. I gave it an 8, as it left you longing for more of the mango salsa taste. The mango salsa chips we had came in a wavy style, which I appreciate more than the regular chip structure. The mango salsa chip isn't a very strong chip in terms of lingering flavor, but you can easily get lost in an entire bag while watching TV if you're not careful. The cappuccino chips possess a fierce aroma. We ate these second after the mango salsa chips and as soon as we opened the bag the cappuccino chip scent overpowered the mango scent. Some might have an issue with the scent being that strong, but I appreciated the chip for doing its thing. It demands your attention. Cappuccino doesn't belong on a potato. It's that simple. The taste wasn't bad, but it certainly wasn't anything I could imagine eating on a consistent basis. It tasted like it belonged on a cookie instead of a chip. The taste didn't leave as fast as the mango chips. And since the finish was identical to the taste it also earned a 6. I initially gave the chip a 7 for intangibles. I liked it a bit more than the mango since it was regular and not wavy. I had to bump it up to a 7.5 though when I realized that it tasted like that cinnamon butter they give you at Texas Roadhouse. Love that stuff. The other glass-half-full quality the chips had is that there is no real caffeine in them, so you can crush a bag at night and still turn in. Wasabi Ginger and Bacon Mac & Cheese next week. The annual postseason college football game played in Bismark, North Dakota will for the next four years be known as the Broad Street Beat Bismarck Bowl as part of a sponsorship deal signed between Broad Street Beat sports blog and ESPN events. The arrangement marks one of the most high-profile marketing initiatives yet for a low-level Philadelphia sports website and comes as the sometimes illiterate writing styles of Dan Goggin, Matt Ryan, Kyle Babcock and founder Ben Lebo continue to gradually make inroads into mainstream media. It had been going on for months. Triple H and Stephanie McMahon had been refusing to give Daniel Bryan his shot, telling him he wasn't an "A-level talent." Sunday night no one would hold down Bryan. He defeated Triple H to earn his bid in the title match later that night.